On Wednesday, Amazon announced the launch of the Kindle DX, a large-screen newspaper- and textbook-friendly edition of the Kindle. Though the new Kindle sports a number of upgrades that will improve its appeal to students and newspaper junkies, Amazon has yet to show that it really understands reading in the digital age. I haven’t tried the DX, but I have been using a Kindle 2 since it was released earlier this year. Unlike others who seem to really love the Kindle, my experience has been far more mixed. First, as a grad student, I hoped the Kindle would allow me to print fewer Microsoft Word files and PDFs. Fat chance. When it comes to PDF files, the Kindle 2 is a disaster. While the Kindle DX has built-in support for PDFs, the second-generation Kindle requires that all files be converted to Amazon’s proprietary file format. As a result, almost every PDF I’ve converted has pages that look like a multi-car pileup of words and letters. If your document has tables, simple graphics, legal footnotes or any kind of math, readability on the Kindle is a crapshoot. Sure, this will get fixed someday, but Amazon claims support for PDF conversion now (unless you read the fine print and learn that this is an “experimental” feature). If Amazon pitched the Kindle as a device that’s great for reading books from its limited library, I’d be a happy camper. The bait-and-switch tactic, however, is unacceptable. Even simple Word documents get mangled. I’ve had to convert basic, just-a-little-bit-of-bold-and-italic Word documents three and four times before I’ve figured out how to satisfy Amazon’s finicky converter. This is especially odd given that the Kindle has been out for more than a year and that numerous other devices read Word files and PDFs with grace. What I’ve finally figured out is that the only reliable format for the Kindle is pure, unadulterated text. For those who need little else, the Kindle is lovely. For the rest of us, Amazon ought to learn a thing or two about supporting digital media. Another major frustration of the Kindle 2 is its inability to interface well with the Internet. By this, I don’t mean that I want the Kindle to have a great Web browser for online content (as wonderful as that might be). The Kindle wasn’t advertised as a tablet for browsing the Web, and I didn’t buy it to do so. Rather, while using my laptop, I regularly want to read a long article or e-mail on my Kindle rather than on the computer screen. Unfortunately, getting online content from computer to Kindle is far more cumbersome than printing it out. Even though Amazon’s content conversion process works by e-mail, you can’t just forward an e-mail or a Web page to your Kindle. Amazon will convert only e-mail attachments. So if you want to read a long e-mail, you’ve got to save it to a file and then attach that file to a new e-mail. It’s as if Amazon wants us all to become like those stereotypical CEOs who prefer their e-mail printed or faxed rather than read in an inbox. Finally, the Kindle is remarkably deaf to the world of social media. You’d think Amazon, pioneer of user feedback on books, might have included some functionality that allows for reading to be more participatory. Want to form a book club around your Kindle reading? Try booksprouts.com, because Amazon ain’t any help. Maybe you’re an author who wants to update a chapter for current owners? No dice. Curious about which parts of the book you’re reading are the most highlighted? Keep wondering. Like Apple and its tightly controlled iPod/iPhone ecosystem, Amazon seems intent on maintaining a tight leash on customers and ignoring the enormous potential of social media to enhance the digital media reading experience (and, incidentally, lock-in users). Amazon can fix its kludgy document conversion system, but it will have a much harder time selling subscriptions against competitors, say Plastic or iRex, that will one day offer decent Web browsers for reading free online content. 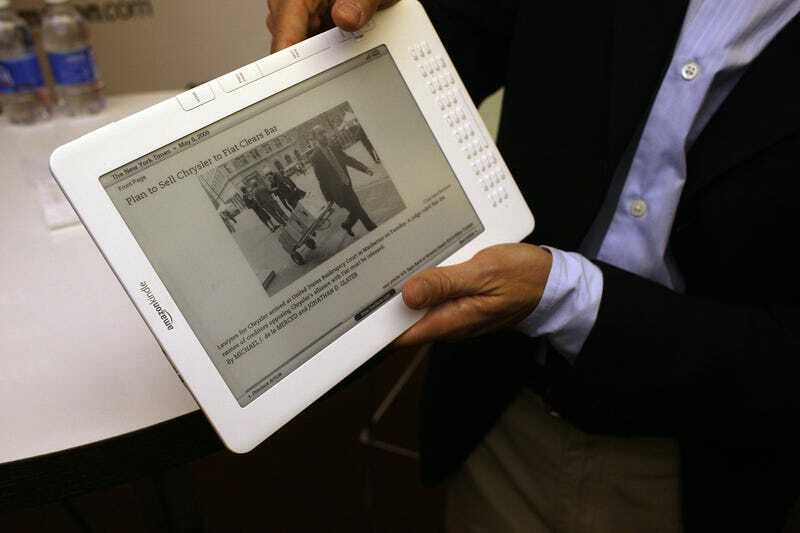 Perhaps even Sony, burned by its attempt to sell a proprietary music format, will make a play for an open standards Internet e-reader. Similarly, if Amazon execs think textbooks are more of a killer app for students than social media, they should check out this new thing called Facebook. I hear it’s all the rage with the kids. “printing has been worth the hassle.” Perhaps, as he says, the Kindle DX will “inch us a bit closer to a paperless society.” So far, my trusty printer has nothing to fear. Omar Wasow is a Ph.D. Candidate in African and African American Studies, and has an A,M. in Government from Harvard University. He was the co-founder of BlackPlanet.com.